These words commonly known as the Shema (hear) are at the heart of Jewish piety. Elegant in their simplicity and powerful in their wisdom, they direct the believer to a proper relationship with God. Jesus preserves this commandment and adds love of neighbor and self to it. We spend a lot of mental activity on God, either trying to “figure Him out,” finding the “right prayer” that works, or becoming obsessed with doctrine. What does it really mean to love? Understanding the true essence and meaning of love is essential to loving. If our understanding of love is distorted, then our loving will be distorted. The other day, I saw a powerful picture of a mother cuddling her newborn baby. The obvious tenderness of the touch, the expressions on their faces, the look in their eyes, and the overall demeanor spoke of an intense moment and connection of love. No words were needed. The bond between mother and child — the delight in the intense moment of presence and the unconditional devotion — were sufficient communicators. It was almost a portrait of one person getting lost in another. You could feel the security, peacefulness, and playfulness of being found and embraced. Mother and child are encircled in a sense of rightness and joined in the discovery of ultimate purpose and place. All of these were truths around this “I love you” moment. How much and what one being knew about the other matter little in this blest opportunity of being-with. God loses Himself in us so that we can be transformed more completely into the image and likeness of Jesus Christ. 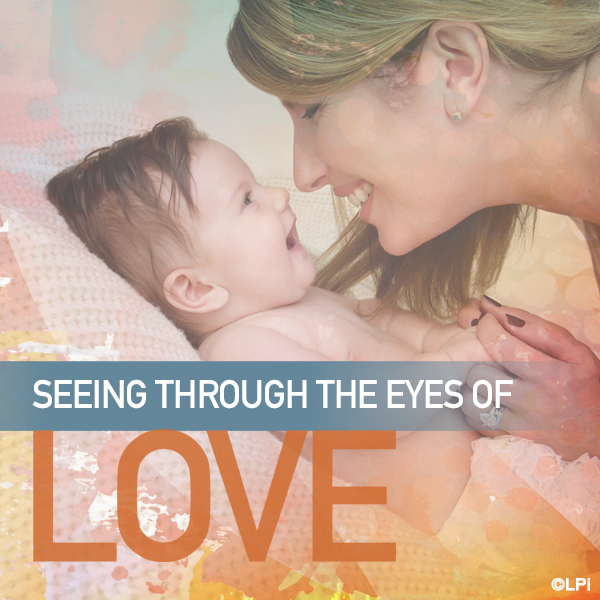 Through the eyes of contemplation, we begin to see as God sees and love as God loves. Because of this loving embrace, we can freely and willingly choose to place our own needs aside. We can then allow God to increase and bring to perfection the divine gifts He gives us at our creation: faith, hope, and love. “You shall love the Lord, your God,” your neighbor, and your very self. Sometimes we water down our understanding of love to things we do for another. Taking out the garbage, cleaning the car, buying flowers, and leading a devotional life are all things we do as statements of our love. Yet, love is much more than these kind, noble gestures. There is a condition of being that precedes all of this, a genuine “I want to be with you and need to be with you” sense that permeates from the core of one’s being. So many have a difficult time understanding that they have been loved into existence. I guess it is easier to conclude that we just evolved as simple products of a growing planet. Distinguished from animals and plants by the presence of reason, we are simply one among the other inhabitants. If that’s all there is, then what’s the point? Life then becomes all about self-fulfillment and survival of the fittest. Whoever wins then wins and loses then loses. We all turn to dust at day’s end. It’s a limited vision that uses love as something I need more than something that brings me to a deeper place and fulfillment when I give. Faith is a leap, primarily from the unintentional to the intended, the accidental to the purposeful. Faith tells us that we are NOT accidents or random occurrences. Rather, we are intentional persons who are loved and intricately designed children of a God, who wants nothing more than to gaze into our eyes and receive our gaze in return! He wants us to have many “I love you” moments in time — when we are embraced and loved and when one being is lost in another — and moments of security, peacefulness, and even playfulness. “I love you, God,” the child says. “I love you even more,” says God in return. To love is to be wholly devoted to another. It requires that I give my entire essence or soul to the truth of who I am, to my intended being in God and purpose in God’s kingdom. To love is to understand wholly and completely that I cannot “be” without God and that it is God’s own love-presence that flows through me, sustains me, and flows out of me. That is why it’s so important to love our neighbor. It has to be. This doesn’t mean that I just do nice things for them but that I really and truly see myself lovingly connected to all of my brothers and sisters. This is why we must protect life at all costs. When someone is hurt, we’re hurt. We cannot allow ourselves to become numb to the pain and suffering of others. We are all connected. If we look into the eyes of someone we only know as a fellow journey-person, brother, or sister in faith, what do we see, who do we see? There is a profound story beneath those eyes and in their soul. It is a story of embrace and love and of wounds that caused pain. Their eyes speak of successes and failures, sin and grace, the deep and often soul wrenching need for love, a desire for faith, and much more. Companions on a journey to, with, and in God. We like to complicate things. Jesus kept it all very simple. In a moment of quiet, allow your soul (your inner eyes) to contemplatively (lovingly) gaze upon and seek God. Allow yourself to get lost in the gentle darkness and reach inwardly for the Other, your Creator. Allow God to find you and enjoy a quiet moment, if only quickly, between two best and inseparable friends. This is where contemplation begins and we begin to see and feel differently.